One of my favorite places in the world on any day of the week is early morning inside a Panera bakery. Every day the baker comes in the kitchen hours before we stir and begins the day when most of us are still snug in our beds dreaming of whole wheat loaves, Jewish seeded ryes, and jelly-filled treasures. Soon all those fresh breads and pastries are done and lined up on the shelves waiting to greet us. As we enter the bakery a divine aroma assaults our sense of smell. The inner sanctum of the bakery is filled with the incense of fresh baked delights. The bakery’s atmosphere is filled with wonderful aromas that entice us deeper into this modern day ‘holy of holies.’ God is enthroned in heaven and my plate has a delectable Danish or bagel on it and a strong ‘java brewski’ warms my hands. I can’t wait to take the first nibble and first sip. I think this has to be the closet place to heaven on earth. Amazing, isn’t it? Bread, pastries, and coffee are such simple foods: flour, water, a little salt and some other basic ingredients. Some ground beans and hot water. Yet the combination of them produces something almost divine. It’s something we crave; it’s something that calms us. It’s something that helps us to begin the day and gets us off on the right foot. I remember when my mother used to bake bread at home. She always did so as I was returning home from school. I think she did this purposely. It was always a treat and the house was filled with such a wonderful aroma. When I opened the back door of the house and came into the kitchen all my day long scholarly problems and misadventures evaporated. Ma always made me sit down at the table with a glass of Twin Pines milk and put a slab of butter on the still warm bread. On, Ma, where are you now? Bread is simple nourishment in human life and yet it can do so much to bring happiness and serenity to our lives. 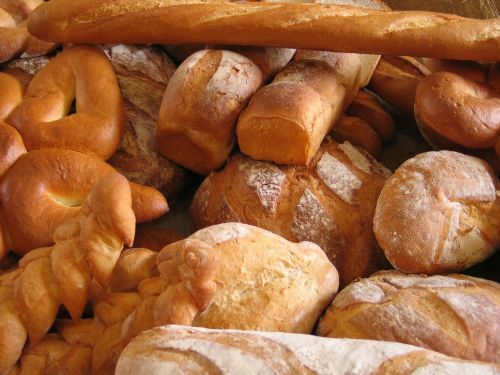 The fresh bread’s aroma, its flavor, and its warmth produce such joy and contentment. A slice of tasty, warm bread can produce a feeling that is priceless. Today we celebrate the old feast of Corpus Christi or, as we call it now, the feast of the Body and Blood of Christ. It’s the feast of our Eucharist. I always thought it strange how God opted to be present with us over the long haul. When Israel wandered in the desert, fleeing slavery in Egypt, God led and protected them in the form of a pillar of fire at night and a cloud during the day until they arrived safe and sound in the Promised Land. As a settled community God stayed with them in a Temple’s inner chamber with nothing inside – a large, empty, bare space. And now, it’s our time. How is God present among us? There are many ways that God is with us but the one we celebrate today is the ‘bread and wine,’ the Eucharist. How odd, don’t you think? Why didn’t Jesus opt for a more powerful, more dramatic, a more Cecil B. DeMille Ten Commandments type of way of remaining with us? In English we use the expression “breaking bread.” It means we sit down to eat, to share something together around a common table. This breaking of bread not only satisfies our hunger and gives us the strength to carry on and face the struggles that are sure to come the next day, but it also binds us together as one. Gathered around a common table we become one at least for a short moment in time. Perhaps this ‘table fellowship’ is a premonition of what heaven might be like! Have you ever wondered what the difference is when we eat around the “Lord’s Table” or eat around a table in a restaurant? In both we gather together in a common space and eat and drink. Correct? However, the tables in the restaurant have no way to encourage us to have a meaningful contact with those who gather with us. I find it interesting what Alan de Botton – an atheist – wrote in his recent book Religion for Atheists. Here, in our sacred spaces, our churches, around our special tables, our Eucharistic tables tell us that race and gender matter not. It shows us that social rank is irrelevant. It also reminds us that educational achievements become immaterial and that citizenship is immaterial and meaningless. We become as one sitting at the Divine Banquet where the Lord is the host of us all and all are God’s guests. Around this special table God’s love is distributed equally to all without prejudice or bias. Here, for a fleeting moment, all of us who gather have a foretaste and aroma of God’s love for us – one and all, without exception. Around our Eucharistic Tables we gather before God as equals. All are precious in God’s eyes and God loves us all with an equal affection. So much so that God is willing to share with us a heavenly meal, a simple Jewish meal of bread and wine that has become, through the miracle of our Mass, His Body and Blood: His sacramental, living presence among us again. Jesus is present here. He is the host and we the guest and all are embraced by His loving and all-encompassing arms. Not only does Jesus shower down upon us His love and affection but also He nourishes us for the journey ahead. Jesus knows full well that we will encounter many struggles and difficulties in the days that follow. Ours is a dangerous and violent world that will assault us and lead us down paths that are only blind alleys. We need a special, spiritual, strength and nourishment to aid us during our lifetime’s journey. The assaults and attacks that will harass and badger us during our earthly sojourn will undoubtedly tire and weaken us. We need a special food to strengthen us. The feast of Corpus Christi reminds us that we still have a road ahead of us in this dangerous and absurd world and we need food for this journey ahead. Today’s feast reminds us to crave this divine nourishment always. God is present here! God is our nourishment! Eat and drink for the road ahead is rough indeed! A Mission "On The Cutting Edge"